It’s 2019 and each one of us wants it to be a huge sartorial success. It is well said that “your skin reflects your overall health”, so the best thing to remember is to eat a healthy diet and avoid junk food, do not smoke, exercise regularly, and drink plenty of water. Well, that’s a start. It’s the perfect time to start thinking about preventing future damage to your outer layer. When people ask me about my beauty tips, I make sure to offer the best beauty tips that truly make a difference. If you’re a man, woman, or a teenager, take out your notepads and start taking beauty notes. Pronto! 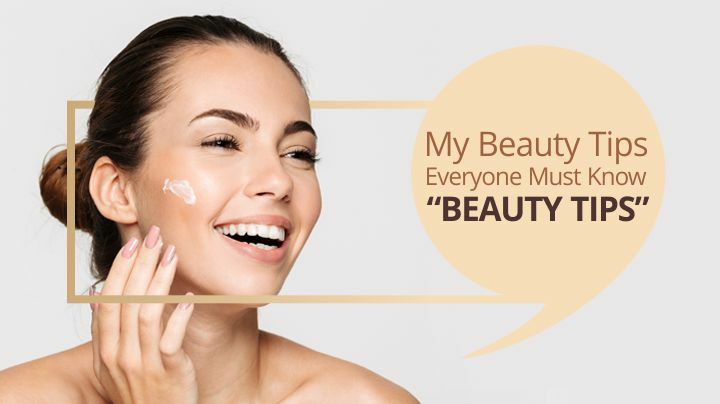 I know what you’re thinking….”I’m a dude, I don’t need beauty tips.” The truth is if you care about the health of your skin, your hair and your body, then you need to have a bit of a beauty regimen. With these simple beauty tips for boys, you’ll be able to keep your body happy without much work. Drink plenty of water. And if your skin still feels a little dry, apply lotion after you shower. Use a body lotion on, well, your body and get a face moisturizer for your face. Add a daily cleanser into your morning or night routine to cleanse your face from pollution, dust, sweat and dirt from. Ideally, a guy should apply sunscreen every two hours. This will help reduce dark tan bands on the forehead and pigmentation. Guys tend to brush aside moisturizing as useless, but this step will pretty much decide how your skin turns out as it ages. Men too need their daily dose to look good and feel good. Even if you can’t work all of these beauty tips for men into your daily routine, starting to do a few of these will help your skin and hair. You’ll look better, but more importantly, you’ll feel better! Splash warm water on your face or even better; take a shower to open up your pores to allow dirt out. Moisturize your skin with a men’s face moisturizer by adding a dime-sized amount to your entire face. If you have dry skin though, you should try a body wash as they usually have more moisturizers in them including Vitamin E, olive oil, and jojoba oil. If you struggle with redness when you shave, a soothing shave cream will save your skin. You need to find a shampoo built for men to keep your hair and scalp happy without drying either out. You may have heard that guys don’t need conditioner. But a conditioner will add back any moisture your shampoo strips away. Every girl strives to maintain her beauty. Some are naturally beautiful, while some need to take certain steps to achieve that beauty. It is necessary to support your beauty not only to be the most popular girl in town, but also to boost your confidence and self-esteem. Use a mild cleanser to clean your face thoroughly at least twice a day in circular motion and wash it off. Follow it up with toning. Use a good quality mild toner. After toning, apply a moisturizer. Moisturizing keeps your skin healthy and prevents dryness. Get an all over body scrub to remove dead skin from body areas like the shoulders, back, and chest. Moisturize your lips to avoid drying them out. Try to keep your hair close to your natural hair color. Avoid harsh coloring. Respect you complexion and steer clear of harsh, dehydrating ingredients. Supercharge your serum and opt for something vitamin-rich, which will help to combat free radicals, preserve precious collagen and maintain skin’s strength and elasticity. ALWAYS wear sunscreen; it’s the single most important thing you can do to protect against the ravages wrought by UV exposure. Bedtime is prime time for deep moisturizing, fighting future lines, plus treating your lips, cuticles, heels, and other problem areas. Aim for seven to nine hours of beauty sleep per night. Turn these grooming, aka beauty secrets into beauty essentials. Follow and use them as some magic tricks for having those impeccable and envious looks that will attract everyone’s attention. Take the crash course on how to rejuvenate and refresh your skin so it looks and feels sensational this season. Complete your look, from head to toe with the help of my beauty tips.